Imagine you arrived at a restaurant where the exterior was all wrapped up so you couldn’t see the inside, and all you could see was the LED marquee sign by the door. Then, as you were led into the restaurant the interior décor made you feel like you entered a night club, and you started thinking to yourself, what the heck did I get myself into?! 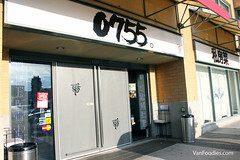 That’s kind of how I felt when I went to 0755 Restaurant and Lounge in Richmond. As part of the Chopstick Fest preview, a few of us were invited to sample the menu of this restaurant. Frankly I didn’t know what to expect even by the time we were seated inside. According to the menu, 0755 is an area code in Shenzhen. 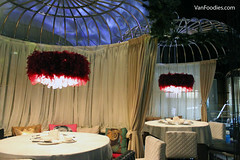 It symbolizes that the restaurant menu is inspired by the food culture of this city in Southern China. Sour Jellyfish Head – Jellyfish head is actually the edge of a piece of jellyfish, so it has a crunchier texture that regular jellyfish. Because it didn’t have much flavour on its own, it really took up the black vinegar and chili pepper in the marinade. 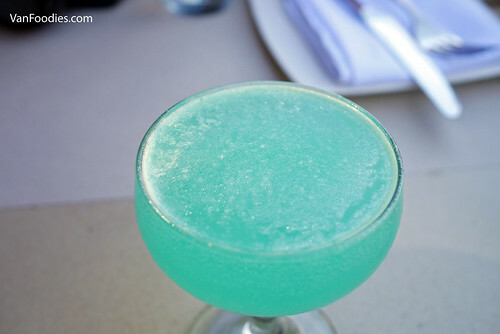 It’s quite refreshing and the sourness helped whet your appetite. 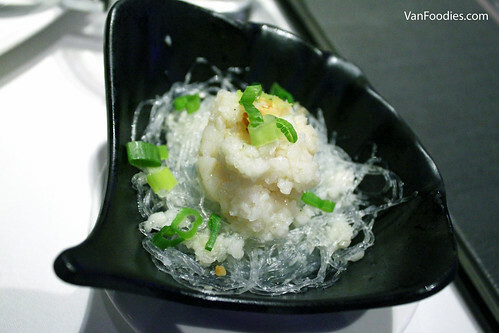 Garlic Steamed Scallop – This is one of my favourite ways to prepare fresh scallops. It reminds me of my visit back to Hong Kong where we had a big seafood feast in Tuen Mun. The fresh scallops would be steamed on the half shell with a garlic sauce. 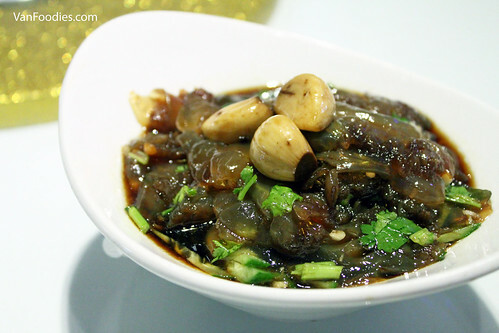 If you are a garlic fan, you would really enjoy the prominent garlic flavour. It’s light, but luxurious at the same time. Braised Spot Prawns – I usually prefer lighter sauces for spot prawns so I could taste their natural sweetness, but this dish really surprised me. While we were in the Okanagan, of course Hester Creek wasn’t the only winery we visited. 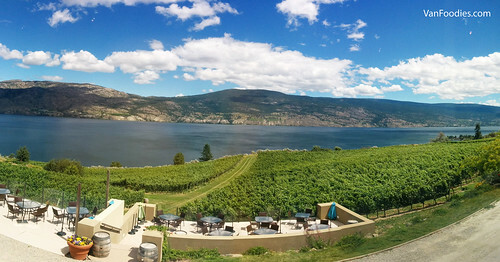 On this trip, we ventured out to Summerland, specifically the Bottleneck Drive area, and we discovered Evolve Cellars. Evolve Cellars was open in 2015 and above the tasting room is e, its dining room. Simple decor – white wall, white table cloth, with big window panes overlooking a gorgeous view of its vineyard and Lake Okanagan. Bryan, Kathryn, Mr. and I made a lunch reservation prior to getting there, and we’re patting our back for making a good choice. e’s lunch menu is quite interesting. I like that they incorporate their wine into many of the dishes. We shared a few appies, including the Seared Scallops. There was nice caramelization on one side of the scallops, the scallops were cooked to the right temperature, tender and sweet. The roasted corn salsa gave it some smokey flavours and crunch. 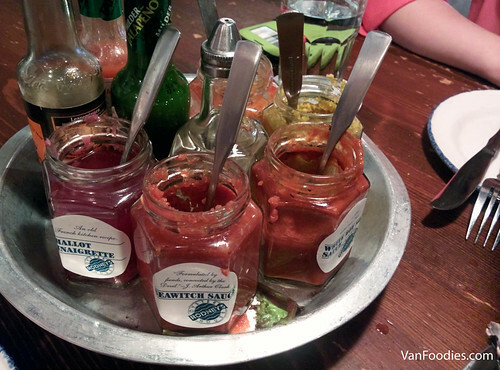 For us, they were served on a spoon and it made a perfect bite (Mr. really liked it, because he always wants “a bit of everything in each bite”). The Bruschetta was probably my least favourite appetizer. Don’t get me wrong, it was quite good. 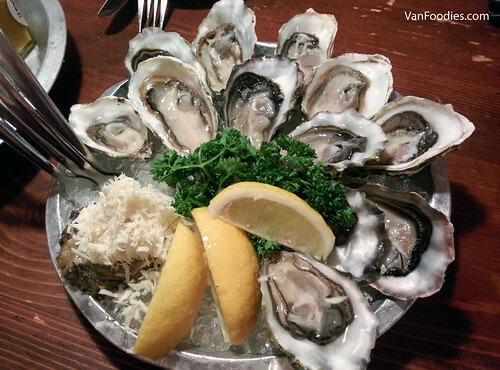 In Vancouver, there is no shortage of fine dining options to celebrate your special occasions. The suburb, is a different story. 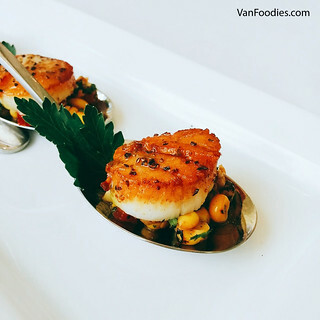 Last year, Hard Rock Casino in Coquitlam revamped its restaurants and introduced Stake, a fine dining establishment focused on sourcing local products. 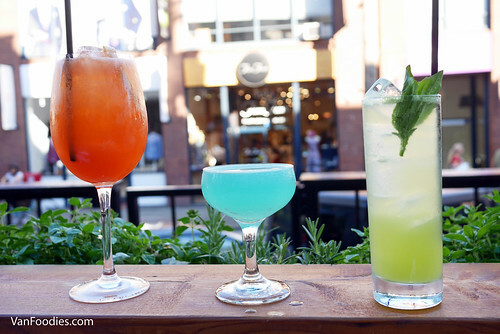 I was there when it launched its menu in the Fall (here’s the proof – check out 0:45 and the hand model at 1:17 – I could be a YouTube sensation one day!) and was quite impressed. So to celebrate CC’s birthday, a few of us girls went there for dinner. The menu isn’t very big, but there are a few good options. We shared a few appetizers to start. 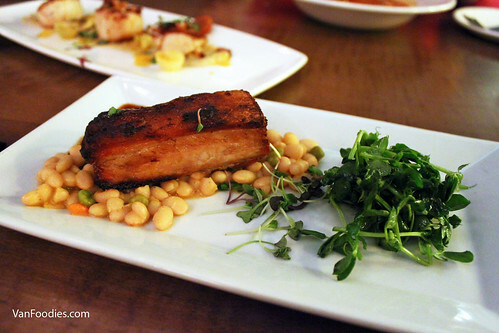 The Signature Smoked Crispy Pork Belly was our favourite appy. The meat was tender, the fatty bits were rendered nicely. Perhaps the edges were a bit too charred but it didn’t have any burned taste. 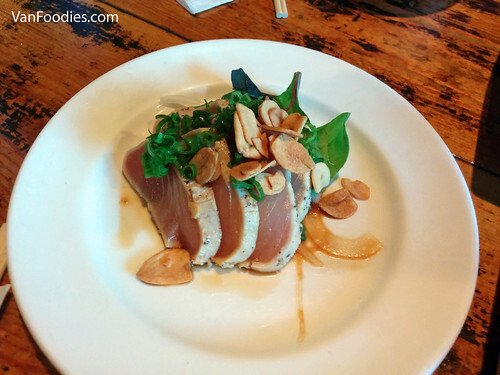 Even though the Albacore Tuna Tataki was a standard affair, I had to commend on the nice sear they’ve had on the fish. I liked the thick cut on the fish, so it gave you a bit of a bite. 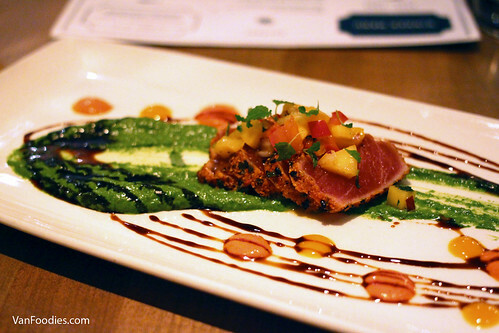 They could probably up the acidity in the sauce to help cut through the rich tuna. With different Japanese izakayas popping up around town, it’s been forever since I last visited a Guu location. I remember the Thurlow location was my very first izakaya that I’ve visited in Vancouver and it was such a unique experience: the screaming servers, the exchange of Japanese throughout the room and the long list of small plates that we could order. 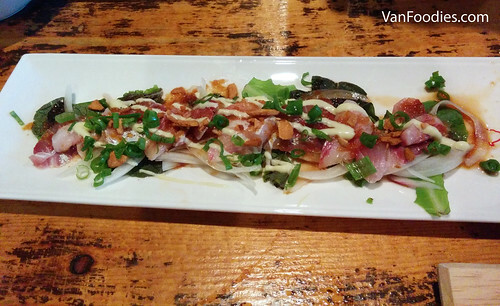 It was so much fun I took a visiting guest to Guu Garlic after. Now, years later, I’m back. Guu Garlic’s name came from the extra use of garlic at this particular location, and it still holds true to this day. With my girlfriends, we ordered a number of dishes. 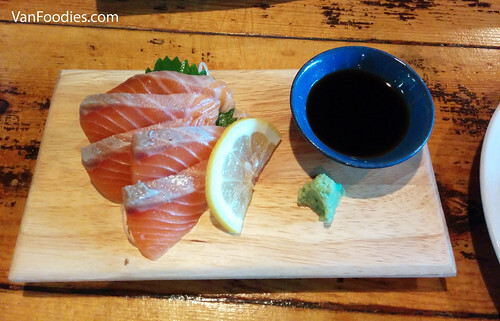 First, the Salmon Sashimi didn’t look super fatty at first, but it’s actually quite good. It tasted fresh and did have a bit of the fatty texture. And so we had an encore of sashimi. 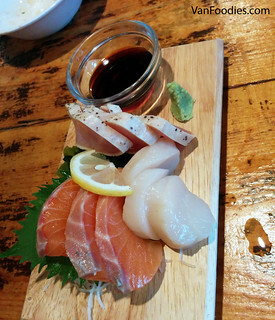 The Assorted Sashimi included salmon, scallops and tuna tataki. Not very many pieces so I’m not sure if it’s the best value, but the scallops were sweet and the tuna tataki was skillfully thinly seared on the outside. 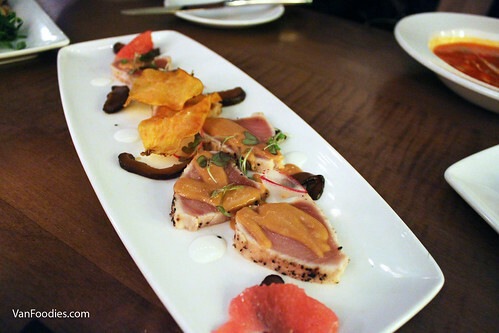 Funny enough, we also ordered the Tuna Tataki (when a bunch of hungry women blindly ordering food off a menu, there could be a lot of similar items lol). The difference here was that they made it more like a salad by including some greens, ponzu sauce and a generous serving of crispy garlic chips (remember I talked about the use of garlic? Proof #1). I prefer this iteration of tuna tataki, using the slightly acidic ponzu sauce, over the sashimi version with just soy sauce. The last raw dish was the Yellow Tail Carpaccio. The flavour of yellow tail (hamachi) is quite delicate, so the sauce was a bit too over-powering in my opinion. The garlic chips (Proof #2) and sliced onion were actually a bit sweet (though also a bit spicy) so they did work with this plate.